Both the book and the narration were superb. The book made me happy that I was not born in in Kabul! That being said, I felt great empathy for the two main characters in the book. What a celebration of the spirit to survive and thrive. Another great book by this author...wonderfully written and read! I look forward to listening and/or reading more books by this author. The book is very sad at times, but it only makes the book more engaging and "real." This novel is absolutely breathtaking. Throughout the entire book the author keeps you interested in the characters and what will happen to them. Excitement never falters, and this story does a fantastic job at recalling the events in Afghanistan at this point in time. The narrator was incredible in that she portrayed each character well, showing the various emotions and ways of speaking. The perfect combination of talented writing, and narration, resulted in me never wanting to hit pause. I finished the entire thing in one day. I highly recommend listening to this brilliant book filled with plot twists and beautiful story telling. I personally was absolutely devastated when the book was finished because it meant that I couldn’t continue enjoying this amazing piece of literature. Well written and well read. An amazing story of the lives of 2 women and the entertwining of their lives. It made me realise that no matter how ordinary a life may seem at times, every life has an effect on others and is important. I loved this book but am very pleased, as a woman, that I don't live in that part of the world. Can only recommend this work - thoroughly enjoyable. While the book did not rival Hosseini's Kite Runner, their novel still burrowed into my heart the vast burden that women in Afghanistan often carry. The cultural differences, religious practices, and relationship dynamics were powerfully described in a way that was hauntingly authentic. The narrator transitioned smoothly from English to Arabic words and added to the listening experience. 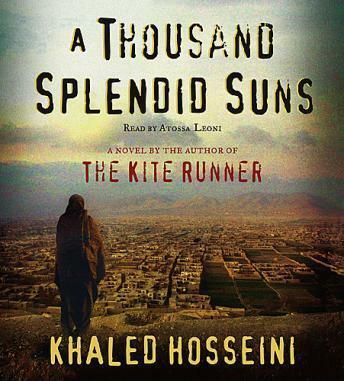 If you want to see the Afghani lifestyle through the eyes of fierce, loyal, sacrificial women, in the turmoil of coups, the Taliban, and 9/11, Hosseini's piece will leave you with an impression you cannot soon forget. I loved the book. The narration really made me appreciate the culture and language. Simply wonderful. I've read this book many times, it is one of my favorites of all time. It really speaks of a life that so many of us don't know, but it connects us through heartache, abuse, perseverance, and love. Mariam is a strong character and the author shows that continuously throughout the book. I thought the narration was just okay. I didn't love the voice of the narrator, it was high pitched and seemed happy even through some very dark scenes in the book. She tried to change her voice for the different characters but it just didn't work out very well. My husband even commented on the voice when he heard me listening to the book. Someone with a lower and broader range for the book would have fit much better I think. This riveting story brings you behind the closed doors of modest living in Afghanistan. This author is contributing greatly to the world with his books.